Last Fall I started a ‘series’ focused on rivers and their watersheds. Six months have elapsed since that first post and another write up is overdue. Rivers and their drainage networks can conjure up images of adventure, mystery, and perhaps even romance. 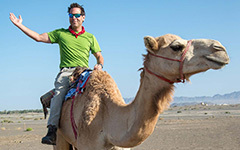 Consider the mighty Rio Orinoco with its waters plying the jungles of Venezuela or the Rhine River coursing by vineyards and castles on its journey to the North Sea. This post is about a decidedly unromantic little watershed; actually it’s a drainage ditch along Longhill Road, about 1 km northwest of Williamsburg, Virginia. Map of the Longhill Road drainage ditch, James City County, Virginia. I transit this watershed nearly every day on my way to and from William & Mary. When I ride my bike home from work I’m often stopped by a traffic light on Longhill Road where the channel disappears into a culvert. The drainage basin is small, with an area of ~21,000 square meters (equivalent to the area of 4 American football fields). The Longhill drainage ditch is a tributary of Chisel Run, which flows into Powhatan Creek, and eventually empties into Sandy Bay on the James River near Jamestown Island. Back in the 1990s when Longhill Road was widened and the adjacent terrain developed for residential use, this headwater tributary to Chisel Run was engineered into a straight channel between grassy slopes. Water rarely occupies this channel; it’s an intermittent stream that flows only during and immediately after a significant precipitation event. 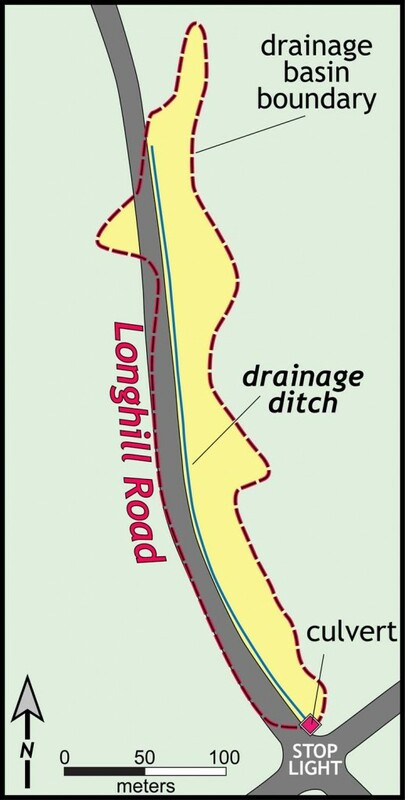 The Longhill drainage ditch was originally graded such that it had a near constant slope. However, in the lower reaches of the watershed there is a small waterfall or knickpoint. The character of the stream changes dramatically at the knickpoint: above the waterfall the grassy terrain slopes gently into the straight channel, below the waterfall the channel has incised nearly a meter (~3 feet) forming a mini-canyon with sediment exposed along its walls with a meandering channel at its base. What caused this knickpoint? It’s a question I often ponder as I pedal by the little waterfall and the mini-canyon above the culvert. Left- Oblique aerial view (from Google Earth) of the lower part of the Longhill Road drainage ditch, note the change in the channel above and below the knickpoint. Right- The knickpoint on a rainy day, note the change in the channel above and below the knickpoint. Year-after-year, as viewed from my bike, it looked as though the waterfall had retreated further upstream from the culvert. One day I got off my bike and did a little fieldwork measuring the knickpoint’s location and the stream’s gradient; once home I consulted past aerial images, collectively these data revealed that the knickpoint has migrated upstream about 17 meters in the last 7 years. There is a migrating knickpoint in the Longhill ditch! Graph illustrating the location of the Longhill knickpoint in 2007, 2010, and 2014. 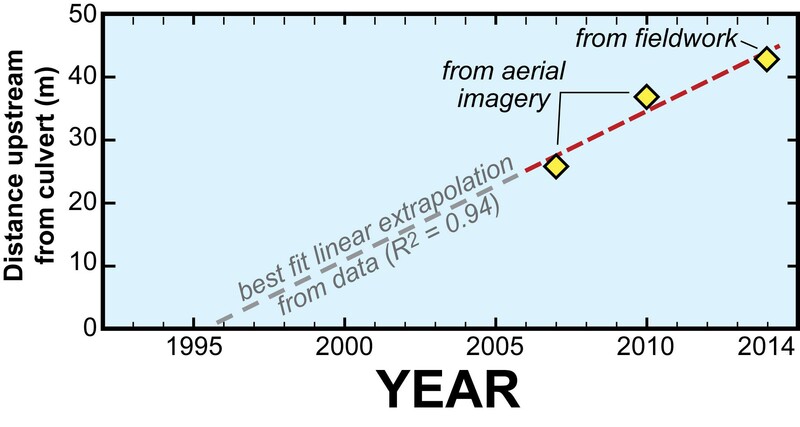 Dashed line is the best linear fit for the three data points. This makes geologic sense as knickpoints are sections along streams with steeper slopes than the regions both above and below. 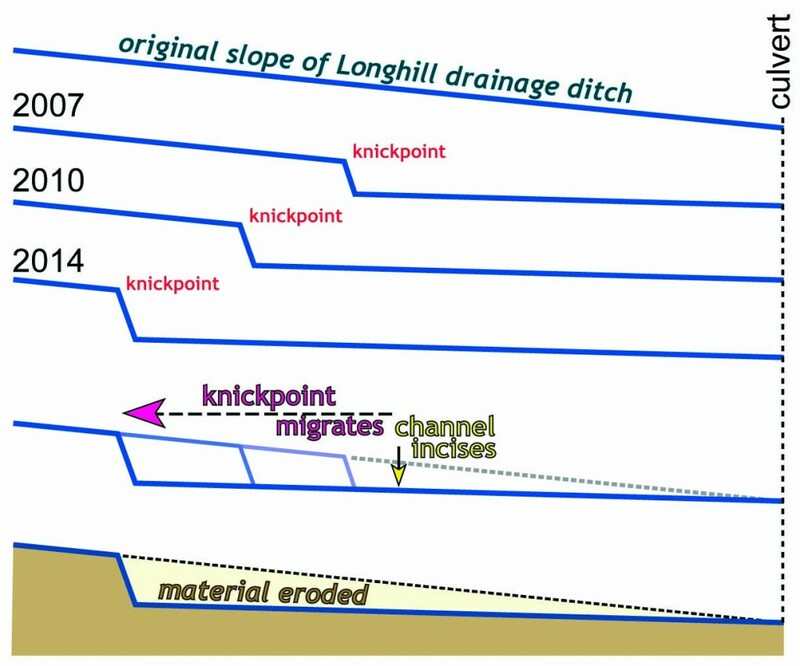 The greater slope increases the shear stress at the base of the channel thereby allowing the stream to more readily erode underlying materials than in non-knickpoint reaches, such that over time the knickpoint moves (retreats) upstream. 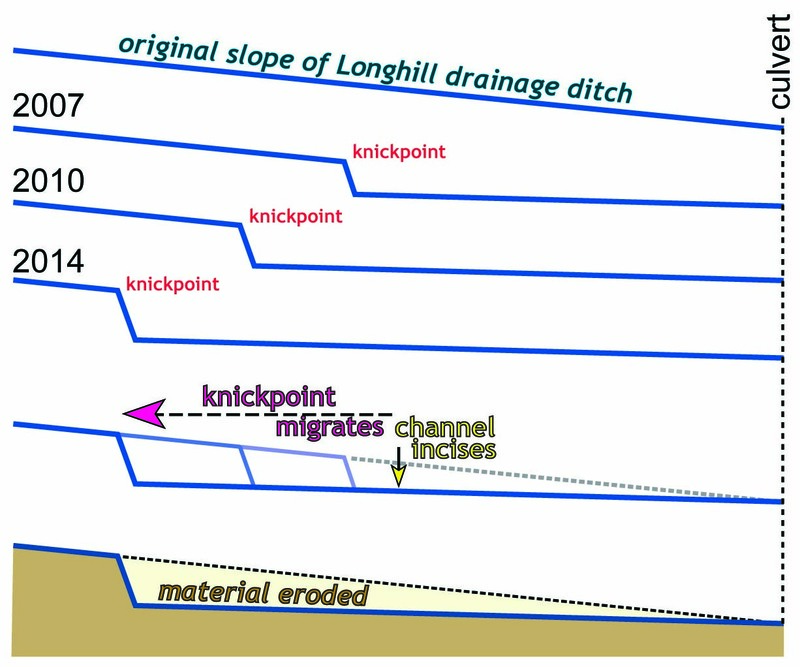 Cross sectional (or longitudinal profile) view of the Longhill drainage ditch. If we linearly extrapolate the knickpoint’s location back in time, based on the data from 2007, 2010, and 2014, it may well have originated at the culvert in the mid-1990s. However, knickpoint migration is not a steady process, I suspect that most of the knickpoint’s retreat has been accomplished during infrequent large flows (say heavy rain from tropical storms that typically roll through the Williamsburg area every few years or so). But what caused the knickpoint to develop in the first place? Knickpoints can be generated in a number of ways: for instance if a stream’s base level drops a knickpoint is created, tectonic activity can produce uplift thereby generating a knickpoint, and knickpoints are commonly developed where streams flow over erosionally resistant rocks. None of these mechanisms seem plausible for the little Longhill drainage ditch. Ways in which knickpoints are generated. One hypothesis for the ditch’s knickpoint is that at some point the culvert was backed up during a storm event, creating a pond above the culvert, when the culvert was cleared the pond rapidly drained generating a knickpoint. It is also possible that the knickpoint formed as a consequence of straightening and steepening the original natural channel to form the ditch. The engineered ditch may have facilitated rapid erosion near the culvert to produce the knickpoint. Knickpoints are common in streams the world over and in many cases are spectacular landforms (e.g. Niagara Falls, Iguazu Falls, and Victoria Falls). 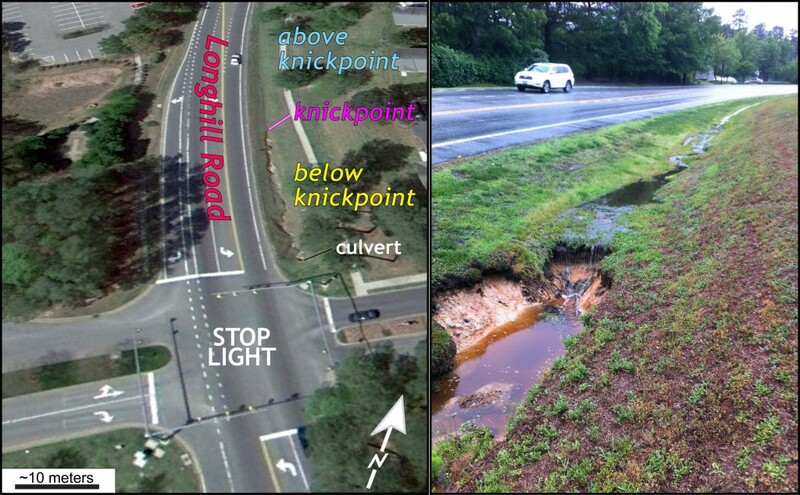 Although the Longhill drainage ditch is no winsome stream, its migrating knickpoint makes a lovely example that neatly illustrates stream processes working at a discernible rate.